Searching for a Slice of Andalusian Paradise by Karethe Linaae was released in the USA on the 5th of February. Now in the American Library of Congress, the book is available through Amazon, as well as Barnes & Nobel, Chapter/Indigo etc. 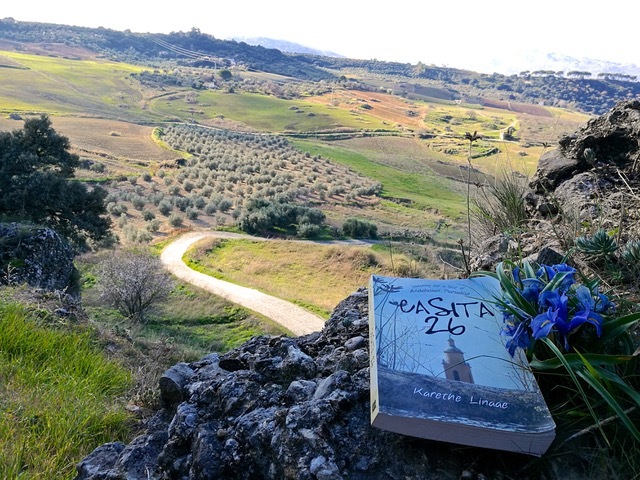 Casita 26 is classified as Travel/Memoirs in line with Francis Mayes books on Tuscany and Chris Stewart’s accounts of Las Alpujarras, following a move from a North American city of millions to a small, rural town in Andalucía. Have you ever wanted to get rid of everything you own and move someplace unfamiliar? This is a true modern-day immigration tale of how Karethe and her husband Jaime left a North American city of millions for a small, rural mountain town in Andalucía. What are the challenges of a transatlantic move in the 21st century? Will an outsider ever be fully welcomed, especially when settling in a very Catholic, hyper-traditional community located way off the freeway system? Take the leap with Karethe and Jaime and discover a world of priceless riches, where passions and tempers run high, kisses are abundant, and where “Help thy neighbour” really means something. Dedicated to the people of Ronda, the original illustrations in Casita 26 are by rondeña artist Virgínia Jiménez Perez.